The survivors of a long-ago invasion have taken refuge in the forgotten underground city of Gravehold. There, the desperate remnants of society have learned that the energy of the very breaches the beings use to attack them can be repurposed through various gems, transforming the malign energies within into beneficial spells and weapons to aid their last line of defense: the breach mages. 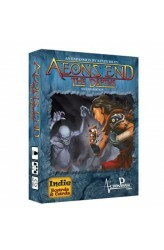 Aeon's End is a cooperative game that explores the deckbuilding genre with a number of innovative mechanisms, including a variable turn order system that simulates the chaos of an attack, and deck management rules that require careful planning with every discarded card. 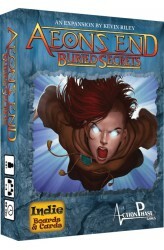 Players will struggle to defend Gravehold from The Nameless and their hordes using unique abilities, powerful spells, and, mo..
Promos from the Aeon's End Legacy campaign, that were not labeled "Kickstarter Exclusive" went into the Buried Secrets expansion. 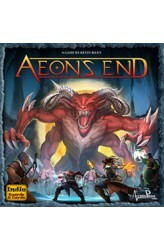 This Expansion provides content for existing Aeon's End games but is not to be used in the Aeon's End Legacy campaign. https://youtu.be/V3VAuNl9N00 .. Deep within the earth, lost in the labyrinth of shadows, the Horde-Crone has awakened the troggs to reclaim the ancient city of Gravehold. 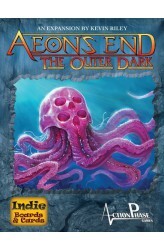 The Depths is an expansion for the cooperative deckbuilding game Aeon's End. This expansion features one new nemesis and three new breach mages, as well as new spells, relics, gems, and minions. https://youtu.be/lRQCxzuszXI .. The Nameless ever encroach on the last bastion of Gravehold. To defeat the dark, one must first become it. The Nameless is an expansion for the cooperative deckbuilding game Aeon's End. This expansion features two new nemeses, and one new breach mage, as well as new gems, relics, spells, and minions. 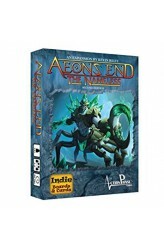 https://www.youtube.com/watch?v=1jeAfvZnklc ..
Aeon's End: The Outer Dark is an expansion for the standalone Aeon's End titles that features two new nemeses and two new breach mages, as well as player cards and nemesis cards. 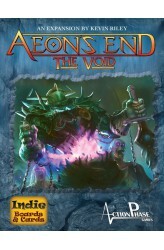 https://youtu.be/-5n8FjfmLnU ..
Aeon's End: The Void is an expansion for the standalone Aeon's End titles that features two new nemeses and two new breach mages. https://youtu.be/L2Pya5YPQck ..
Gravehold remains the last bastion of The World That Was. As the otherworldly incursions from the creatures known only as The Nameless intensify, a cadre of strange survivors emerge from the void itself. Will they be Gravehold's salvation or its undoing? 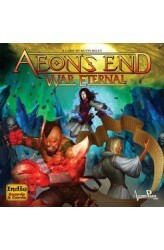 War Eternal is a standalone game compatible with the cooperative deck-building game Aeon's End. Players struggle to defend Gravehold from The Nameless and their hordes using unique abilities, powerful spells, and an all-new cast of dynamic characters. Featuring a number of innovative mechanisms, including a variable turn order system that simulates the chaos of an attack and deck management rules that require careful planning, War Eternal can be played alone or combined with other Aeon's End content for.. In a place outside the waking world where children go while they sleep. Wander the dreamkin—lost sleepers, whose souls this land seeks to keep. Underneath the gentle waves of lucid seas we fell. We’re off to find our missing friends in the vast Dreamwell. 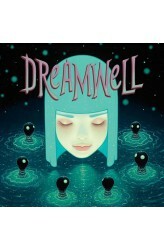 Dreamwell is a 2-4 player competitive game featuring the art of Tara McPherson where players are trying to locate their lost friends in the Dreamwell. The Dreamwell is represented by a 4 x 4 grid of tiles. Each tile shows a environment and a creature, in addition to pathways to neighboring tiles. At the beginning of the game, players will be dealt two cards, each of which shows a picture of the friend whom he or she is trying to locate along with the two creatures and environment that wil..
As soon as you saw the ad in today’s Tribune, the certainty flooded over you. At last, this is your chance, the reason for all your training! All that work waterproofing your utility belt and practicing your one-liners will finally pay off. You call into work sick, feed the cat, and turn on your police scanner, waiting nervously for the first call--or at least, the call that’s close enough for you to get there first. You’ll stop at nothing to join your heroes, The Champions of Zeta City, and woe to any wannabe crime fighters who stand in your way! Heroes Wanted is a tactical board game for 1-5 superhero hopefuls, attempting to fulfill their dreams of becoming a member of Zeta City’s exclusive crime fighting super team: The Champions of Zeta City. Each time you play, you will create ..
Kodama Duo is a two-player standalone version of Kodama: The Tree Spirits and a 6th player expansion. 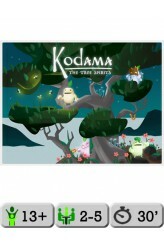 You will grow a tree by placing branch cards in clever arrangements, making a happy home for your Kodama! 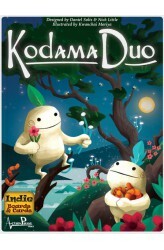 Kodama Duo is a card placement game for 2 players that plays in 30 minutes. Players will turn over one Decree card per season to set the unique conditions. During the Growing Phase, players take turns revealing branch cards and splitting them into two piles until each player has added four branch cards to their tree. In the Kodama phase, players will each choose one of their Kodama to score and live in their tree. The game last 3 seasons (12 turns) and whoever cares for their Kodama best will be remembered for generations! There are a couple of cool twist.. The forest is growing fast! As caretakers for Kodama, the tree spirits, you must keep the forest a healthy and lush home for your little friends. Over three growing seasons, you must cultivate trees with the right mix of flowers, insects, and branch arrangements to make your Kodama as happy as possible. Whoever cares for their Kodama best will be remembered for generations! From the designer of the hit game Kigi, Kodama: The Tree Spirits branches out into a fun new way to play! Grow your tree by placing cards in clever arrangements, being careful to leave room for future growth. At the end of each season, one Kodama will award you points for how well your tree suits its needs. With beautiful art and innovative mechanics, Kodama is an inTREEguing game for the whole family. .. The Realms lay divided, their former wonder lost and forgotten. The Tyrant Queen has seized the throne, forcing the rightful heirs deep into exile. You are the sons and daughters of the once-great houses: Foxway, Gorga, Mherzeen, and Spyre. Under the tutelage of advisors, you have gathered your followers, your conscripts. The time has come to take back what is yours. 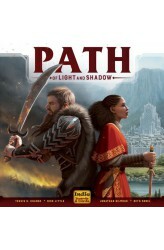 Path of Light and Shadow is a massive empire-building experience, combining area control, deck management, and civilization customization. As players vie for control of The Realms, they must enlist and promote supporters, outfit their burgeoning empire with powerful technologies, align with powerful leaders, and lay siege to rival exiles after the throne. Above all else, each player must decide what type of leader ..